The BMO Harris Bank District 204 Volunteer of the Month is being awarded to Kelly Sherwood from Metea Valley High School. Kelly has two children at Metea Valley High School and has enjoyed volunteering in District 204 since her daughter was in kindergarten thirteen years ago. She currently chairs the Parents Theater at Metea and has helped in many different capacities including concessions, ticketing, tech week meals, and costumes. Over the years, she has worked with Madrigal Dinner, Collage, Fine Arts Festival, and numerous other music related activities. With a belief that exposure to the Arts is extremely important, Kelly feels lucky to have such a strong fine arts department in our schools and is grateful for the numerous opportunities District 204 offers. Kelly tries to support these programs as much as she can and says she is particularly appreciative of the Theater department and the amazing teachers who create diverse opportunities that encourage kids to develop confidence and learn to support each other both on stage and off. Kelly had several nominations for this award, one of which stated "Mrs. Sherwood's ability to interact with the students, coordinate with parents, and collaborate with staff makes her unique and invaluable. And though her wonderful daughter, Darby, may be graduating, I hope she knows that she will always be a valued member of Metea Theater." 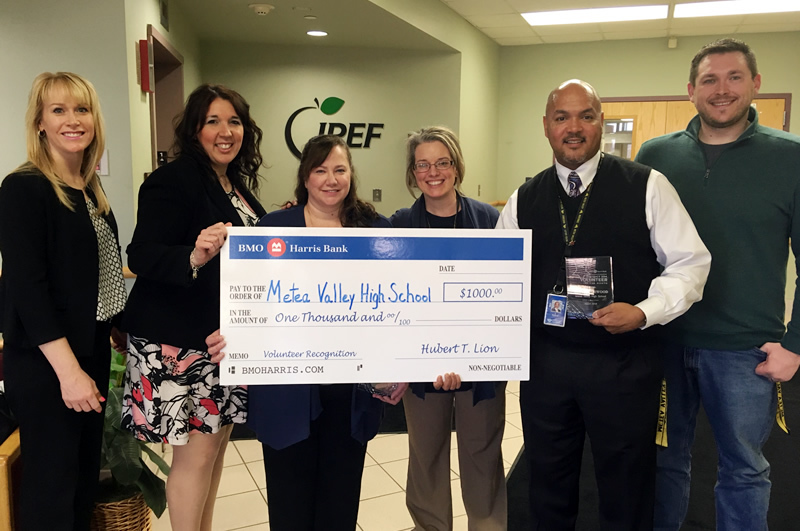 BMO Harris Bank is helping District 204 recognize one volunteer each month who has generously given his or her time to support District 204's students and schools. To celebrate these outstanding volunteers, BMO Harris Bank is donating $1,000 to the volunteer's school. To nominate an outstanding volunteer, visit Volunteer of the Month.